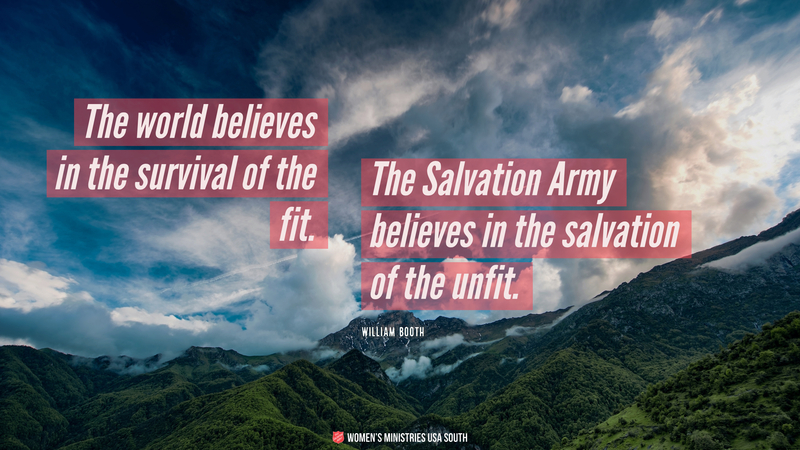 Neither water, sacraments, church services nor Salvation Army methods will save you without a living, inward change of heart and a living active faith and communion with God. Make your will, pack your box, kiss your girl, be ready [to go to training] in a week. Oh, my comrades, again I say what I have said before – when you see your duty, that is the moment of action. Don’t let that moment slip, and so miss the power of it, for, perchance, you will never be as strong again. I’m not waiting for a move of God. I am a move of God. 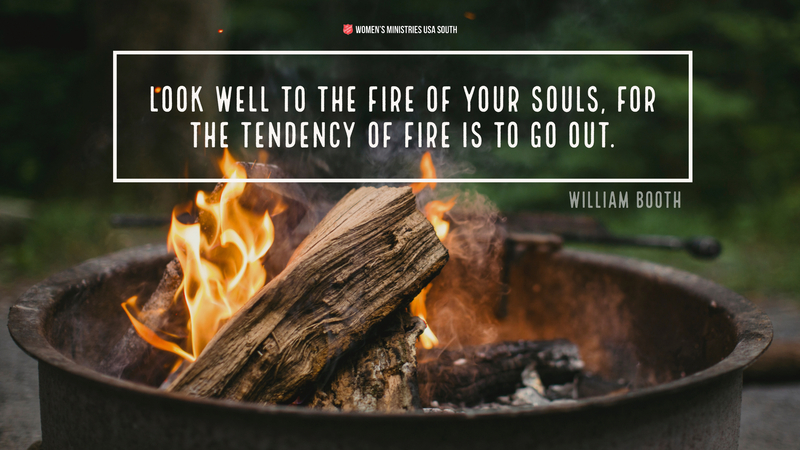 Look well to the fire of your souls, for the tendency of fire is to go out. Some men’s ambition is art. Some men’s ambition is fame. Some men’s ambition is gold. We had God in man two thousand years ago; now we need the Bible in man. I will tell you the secret [of success]. God has had all there was of me. There have been men with greater brains than I, men with greater opportunities. 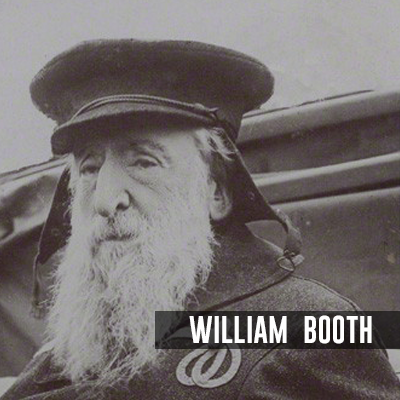 But from the day I got the poor of London on my heart and caught a vision of all Jesus Christ could do with them, on that day I made up my mind that God would have all of William Booth there was. 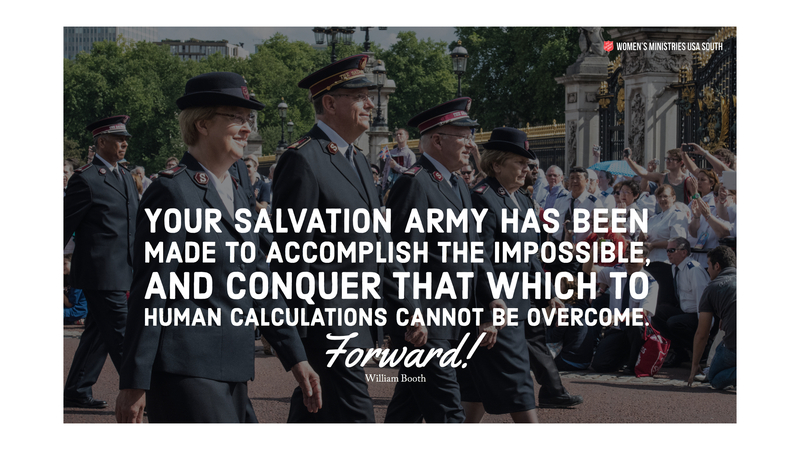 And if there is anything of power in the Salvation Army today, it is because God has had all the adoration of my heart, all the power of my will, and all the influence of my life. Suppose we woke tomorrow morning and found that every Bible at present in existence had been taken out of the world? Or suppose – which would amount to the same thing – that, all at once, we discovered that every page in our Bibles had become blank paper? What a mourning and lamentation there would be, and justly so. People who had never thought it worth the trouble to read, and disbelieved would mourn. Even people who had read and disobeyed would feel they had lost what could never be replaced. If you are cut out for being an Officer, an Officer you must be, an Officer you will be, or it will be so much the worse for you both here and hereafter. If a man has a money-making spirit, he will probably make money. If a man has an ambitious spirit, he will possibly vault to some higher grade of life than that in which he was born. 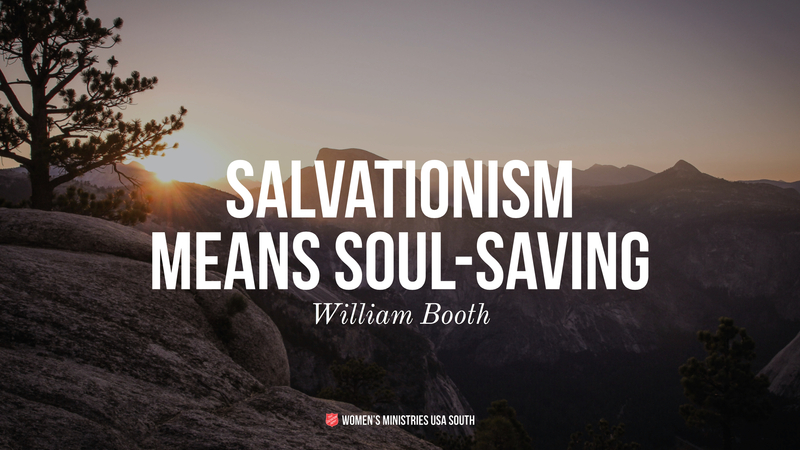 If a man has a soul-saving spirit, he will certainly save souls. It matters little what his circumstances may be. Therefore, the business of every one of us is to come into the possession of an absorbing passion for the salvation of men. “Not called,” did you say? Not heard the call, I think you should say. He has been calling loudly ever since He spoke your sins forgiven – if you are forgiven at all – entreating and beseeching you to be His ambassador. Put your ear down to the Bible, and hear Him bid you go and pull poor sinners out of the fire of sin. Put your ear down to the burdened, agonized heart of humanity, and listen to its pitying wail for help. Go and stand by the gates of Hell, and hear the damned entreat you to go to their father’s house, and bid their brothers, and sisters, and servants, and masters not to come there. And then look the Christ in the face, whose mercy you profess to have got, and whose words you have promised to obey, and tell Him whether you will join us heart and soul and body and circumstances in this march to publish His mercy to all the world. If you had had a tree that had grown up in your garden, under your window, which for forty years had been your shadow from the burning sun, whose flowers had been the adornment and beauty of your life, whose fruit had been almost the stay of your existence, and the gardener had come along and swung his glittering axe and cut it down before your eyes, I think you would feel as though you had a blank – it might now be a big one – but a little blank in your life! If you had had a servant who, for all this long time, had served you without fee or reward, who had administered, for very love, to your health and comfort, and who had passed suddenly away, you would miss that servant! If you had had a counselor who, in hours – continually recurring – of perplexity and amazement, had ever advised you, and seldom advised wrong, whose advice you had followed and seldom had reason to regret it; and the counselor, while you are in the same intricate mazes of your existence, had passed away, you would miss that counselor! If you had had a friend who had understood your very nature, the rise an fall of your feelings, the bent of your thoughts, and the purpose of your existence; a friend whose communion had always been pleasant – the most pleasant of all other friends – to whom you had ever turned with satisfaction, and your friend had been taken away, you would feel some sorrow at the loss. 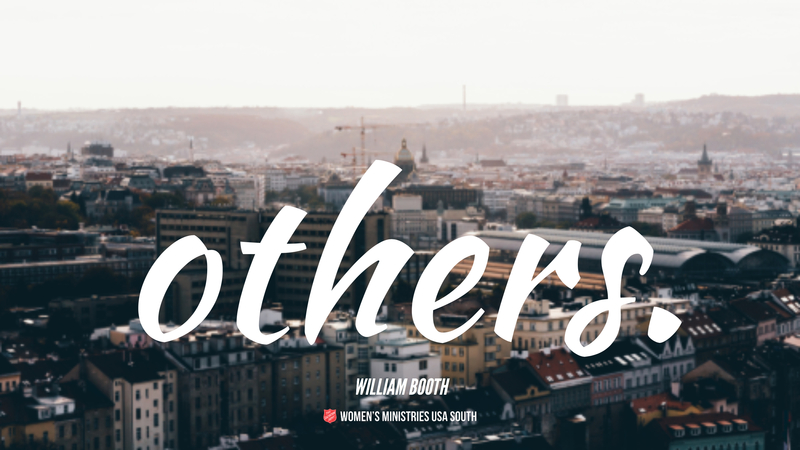 If you had had a mother for your children, who had cradled and nursed and trained them for the service of the Living God, in which you most delighted – a mother, indeed, who had never ceased to bear their sorrows on her heart, and who had been ever willing to pour forth that heart’s blood in order to nourish them, and that darling mother had been taken from your side, you would feel it a sorrow! If you had had a wife, a sweet love of a wife, who for forty years had never given you real cause for grief, a wife who had stood with your side by side in the battle’s front, who had been a comrade to you, ever willing to interpose herself between you and the enemy, and ever the strongest when the battle was fiercest, and your beloved one had fallen before your eyes, I am sure there would be some excuse for your sorrow! Well, my comrades, you can roll all these qualities into one personality, and what would be lost in each I have lost all in one. There has been taken away from me the delight of my eyes, the inspiration of my soul, and we are about to lay all that remains of her in the grave. I have been looking right at the bottom of it here, and calculating how soon they may bring and lay me alongside of her, and my cry to God has been that every remaining hour of my life may make me readier to come and join her in death, to go and embrace her in life in the Eternal City. This afternoon my heart has been full of gratitude because her soul is now with Jesus. She had a great capacity for suffering and a great capacity for joy, and her heart is full of joy this afternoon. My heart has also been full of gratitude because God lent me for so long a season such a treasure. I have been thinking, if I had to point out her three great qualities to you here, they would be: First, she was good. She was washed in the Blood of the Lamb. To the last moment her cry was, ‘A sinner saved by grace.” She was a thorough hater of shams, hypocrisies, and make-believes. Second, she was love. Her whole soul was full of tender, deep compassion. I was thinking this morning that she suffered more in her lifetime through her compassion for poor dumb animals than some doctors of divinity suffer for the wide, wide world of sinning, sorrowing mortals! Oh, how she loved, how she companioned, how she pitied the suffer poor! How she longed to put her arms round the sorrowful and help them! Lastly, she was a warrior. She liked the fight. She was not one who said to others, ‘Go,’ but ‘Here, let me go,’ and when there was the necessity she cried, ‘I will go.’ I never knew her to flinch until her poor body compelled her to lie aside.